This is the 2018 release of the Loch Gorm. It is heavily peated and matured in Sherry casks. 15.000 bottles were made. Very sweet, fruity sweetness, at first in the smell. Dried fruits, heavy peats and loads of farm notes. Hay, and in the end, some vanilla sweetness. After some minutes in the glass, the sweetness dies down a bit. The Sherry influence is not as noticeable in the taste as in the smell. Here, the peat and farm notes are dominant. Some peppery notes in the finish with some dried fruits and oak hiding in the background. Definitely not as sweet as what I first picked up in the smell. 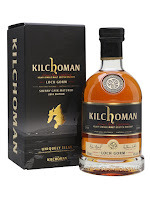 I could have wished for a bit better balance between the nose and the taste, but as soon you have had a couple of sips, you know what the dram is about, so it´s not a big issue. The other versions I have tried have been more Sherry influenced, but I still enjoyed this. I will give this 85/100 (22/21/21/21).